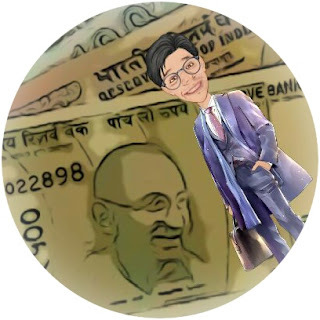 Vitt Vishesh - Personal Finance Simplified! their means. Driven by the deal, they ignore the rate of interest they pay. Indeed, it is not evident that "Discounts are expensive". Deals and Discounts urge you to indulge in an expenses which you were not supposed be incurred at first place. The fear of missing out on irresistible offers make one fall into such a expense trap. need it?”. As a consumer we are segmented and categorized based on our income groups and buying behaviors. In this information age and advent of social media (read marketing platforms) we are bombarded with hidden commands to buy or indulge in product and services. Last week I accidentally did factory reset of my phone. I realize that I spent so much of my time on the apps which were installed on my mobile. With lesser number of apps in my mobile I find my days peaceful. I am not missing out on anything. What is necessary, it is reaching me what may be the case. I forgot to reinstall Whatsapp. Still I am alive and communicating with my near and dear ones. Those who want to reach you will reach you. Technology is just a medium. Technology has equipped these marketers to reach us with innovative ways as well. Market leaders are creating a big lies of the aspiration in their products and services. The challengers to the market leaders are in constant attempts to get our eyeballs rolling. They seek our attention, they want our money and they want you to promote their products as well. Be it online or offline; you must ask yourself "Can I manage for a couple of weeks, I don’t buy this now?" Watch this youtube video to see screen recording of EMI calculation in MS Excel using PMT formula. Banks calculate your loan EMIs through two most common methods; Reducing Balance Method and Fixed Balance Method. Reducing balance method is based on time value of money concept. Whereas Fixed balance method is based on simple interest formula. Reducing balance method calculates interest value at the end of every period (read month). 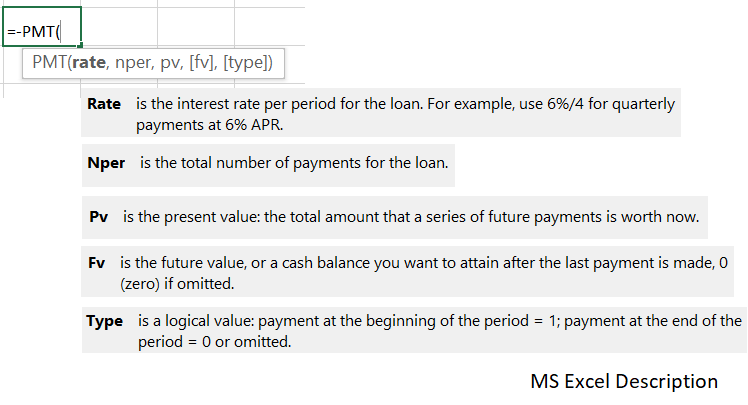 Interest value is calculated on the outstanding amount (principle) at the end of the period. EMI amount is higher than the calculated interest amount. the difference between EMI amount and calculated interest is the principle contribution (pay off) towards your loan. At the end of next period interest will be calculated on the new outstanding loan balance. Since, the new outstanding balance is a reduced amount, interest amount calculation will be lower. With EMI amount being constant the principle pay off will be higher than previous period's principle pay-off. The decrease in interest amount equals increase in principle pay-off. Reducing balance period of this loan is month. Hence, EMI will be paid every month. Annual interest rate of loan is 9%. Hence, per month interest of loan is 0.75%. If this loan began at the start of FY2018-19 (April 2018) the interest calculated on the loan of 50 lac was 37 thousand 500 rupees; as shown in below image. Suppose the subscriber to this loan decided to pay Rupees 40,000 towards EMI, his contribution towards the principle was Rupees 2,500. Hence outstanding balance after the EMI payment was Rupees 49,97,500. If we drag these calculations; we will come to know when outstanding principle will become negative. As we see below 371st month will be when the subscriber will pay his last EMI of Rs. 40,000 and he will offset this loan in 372nd month by paying off 2513 rupees as outstanding principle and 19 rupees as interest. Thus, the loan started in April 2018 will be closed down after 31 years in March 2049. In this example we have a constant interest rate of 9% and steady timely paid EMIof Rs. 40,000. In above chart amount was considered as the constant based on which tenure was calculated. If we make tenure as the constant; lets say 20 years we will need a method to derive on the amount which will help us to get outstanding amount as 0 after 240th EMI of the loan. PMT formula in excel can help you to get EMI amount calculated. PMT is short form of payment which helps to know how much be paid towards servicing a loan with constant payment and interest rate. PMT formula needs following values to calculate. Lets take above data as an example to calculate EMI amount. Present Value (loan amount) = 50 Lacs. Above amount calculated as end of period payment. For begin of period payment the amount will be Rs. 44,651. One can save more every month if they tie up with their lender for a begin of period servicing towards his reducing balance method loan. and his 240th installment will completely service his loan. Above description was related to reducing balance method loan. 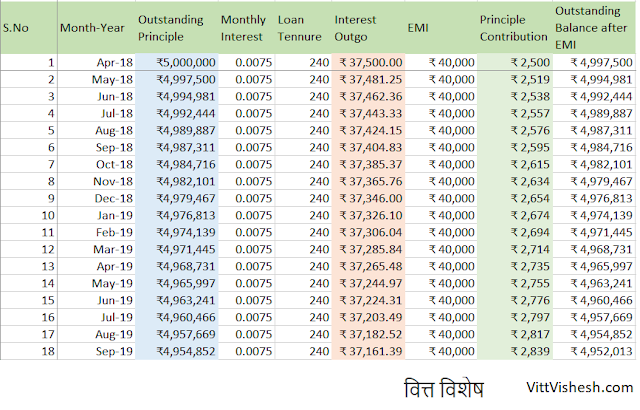 Fixed balance method loan has a different mechanism to calculate EMI. Home loans are calculated using reducing balance method, whereas car loans from private lenders in India are serviced through Fixed Balance Method mechanism. Watch the video in below link to understand the major difference in two mechanisms. There are several types of mutual funds. 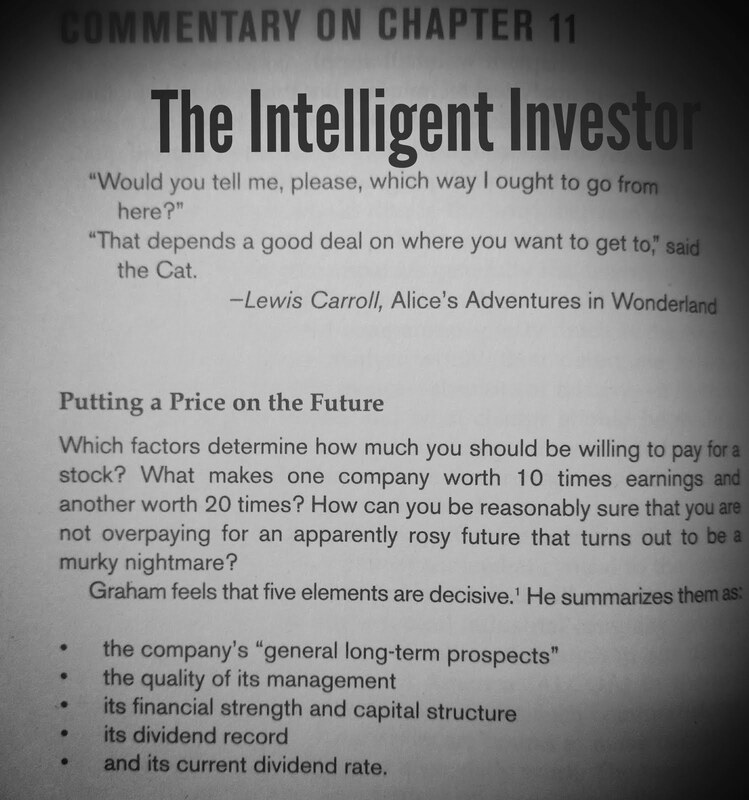 This becomes very confusing for a new investor who is just introduced with the concept of mutual funds. With so many types, options and plans available for each category; the basket of mutual funds is quite broad. A mutual fund selected in combination of above three dimensions can be purchased through a distributor or directly from the mutual fund house commonly referred as Asset Management Company (AMC). They are referred as fund plans. Note: considering the significance of benefits of direct funds, some mutual fund distributors like Zerodha have started offering direct plans through their portals. Debt funds are those funds which invest in money market instruments. Money market instruments include short term treasury bonds issued by central and state government, long term bonds by governments, corporate bonds issued by companies and short term lending to financial institutions. Interest rate fluctuations are observed in money market financial instruments, fund managers of debt mutual funds try to increase yield of their holding by trading on coupon rates. Short term or liquid funds: investing in short term debt instruments. Because of short term fluctuations in interest rates are negligible. Interest rates of liquid funds are aligned with prevailing repo rates. They are most safe mutual fund type. Introduction of LTCG (long term capital gain) tax on equity holding may create a sense of panic for many investors, who already have long term holdings in equity. Even though the stock price on 31st January 2018 will be considered as benchmark price; people will rush to book tax free profit before 31st March. In fact, Nifty and Sensex each had a fall of 2.3% each due to profit booking. Sensex fell 840 points and ended the day at 35066. Nifty fell 256 points and ended the day on 10760. In anticipation for a good budget equity markets rallied to 11000+ levels on Nifty and 36,000+ levels on Sensex. Today's correction in share market was long overdue. There had been a buoyancy in equity secondry market due to enhanced support from domestic institutional investors. DIIs have outperformed Foreign Institutional Investors (FIIs) in past year. Another shocking revelation by Finance Minister was that the equity market performance lead companies to park their surpluses in form of shares and mutual funds. Markets are highly priced at this point of time. In next two months investor will sell to minimize future tax liabilities. This bring the market down at least by 10% from current levels. 10% is my conservative estimation. 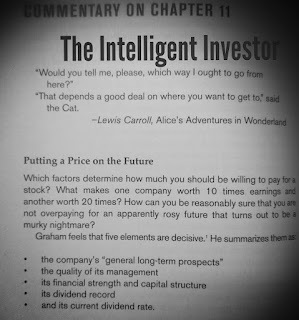 For a value investor like corrections in equity market is a reason to cheer. People feel elated whenever e-commerce companies offer crazy discounts. In the same way lower levels of NIFTY and SENSEX will offer crazy discounts on your favourite shared. As a value investor, we should have an accumulate list. Whenever there are dips in equity market you should have enough cash surplus to go shopping into your demat account. Warren Buffet says hia favourite holding time for his favourite stocks is 'forever'. Next two months will give you opportunity to buy stocks from your accumulate list. Discount brokers like Zerodha do not charge brokerage on share purchase. They only charge for intra day and future and options trading which is a nominal Rs. 20 per trade. Value investing through discount brokerage like Zerodha is brokerage free. As a value investor, we should not be crazy to accumulate products and services which everyone desires or can't live without. Rather we should be crazy to accumulate stocks of those companies which sell such products and services. Personally, if I will get access to invest directly in USA stock exchanges, my first pick will be Apple Inc followed by Google and Facebook. Dividends will be tax free as they are now upto 10 lakh rupees. If your portfolio generates 2% of average dividend yield you would need a portfolio of valuation above 5 Crores rupees to get a taxable dividend. Capital gains from equity upto 1 lakh rupees in a financial year will be tax free. Hence, smaller value investors will still have tax exempt LTCG. Hence, we can summarize this post to conclude that LTCG tax on equity should not derail your plans to build wealth through equity. You can value invest with serenity, courage and wisdom. Do you find personal finance complex and boring? Understanding the power of "Compounding"
© 2018 VittVishesh.com. Simple theme. Powered by Blogger.